This paper describes a survey study into the association between SF behaviours of coaches and clients perceived coaching outcomes. A web-based survey was administered with 200 clients of coaches. The survey consisted of a list of 28 coach behaviours, 14 of which were SF behaviours and 14 of which were behaviours SF coaches would avoid. Clients were also asked to describe on several dimensions how effective the coaching had been. 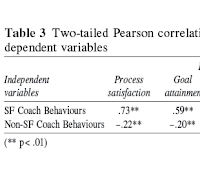 SF coach behaviours were strongly positively associated with positive coaching outcomes. Non-SF coach behaviours were moderately negatively associated with positive coaching outcomes. A multiple regression analysis was done, which gave insight into which specific coach behaviours were predictive of coaching success. The paper closes with some reflections on the implications of this study and with suggestions for followup research.